The pop group funks with Ubisoft's heart over a breach of contract. Mainstream hip-hop group The Black Eyed Peas are known for their multi-platinum albums instead of their involvement in games, but they've entered into an agreement recently with Ubisoft to create The Black Eyed Peas Experience; a dance title for Kinect and Wii. However, it seems that the pop artists have come up short on their end of the deal, because Ubisoft is suing them for breach of contract and asking for $1 million in damages. The complaint doesn't actually mention the name of the group or the game itself, but Ubisoft has filed the lawsuit against an entity called BEP Music LLC, which owns only one trademark: The Black Eyed Peas Experience. 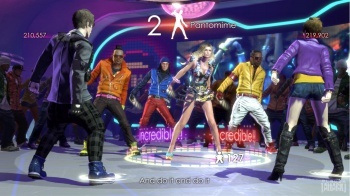 Ubisoft claims that it entered into a contract with BEP Music in June 2011, allowing the company to license "the names and likenesses" of the performers in order to develop, produce and distribute a videogame. Part of that contract included a clause stating that BEP was required to approve anything that Ubisoft submitted to it "no later than...within ten (10) business days". After the November 2011 release of the console version of The Black Eyed Peas Experience, the developers began work porting the title over for iOS devices, and asked for approval from BEP since March of this year. Unfortunately, Ubisoft never received a response from the company despite "repeated requests", and now it states that BEP Music has breached the contract by failing to respond in a timely manner. The iOS versions of the game were originally scheduled for release in April-June 2012. "At the time of BEP Music's breach of contract, Ubisoft had spent 181,000 Euros (approximately $233,000) in developing the IOS game," the court documents say. "As a direct and proximate result of BEP Music's breach of contract, Ubisoft has suffered damages in an amount in excess of $1,000,000, which not only includes Ubisoft's out-of-pocket development costs, but also the profits Ubisoft has lost and will continue to lose as a result of BEP Music's breach of contract."